I FELT THAT A RANT WAS IN ORDER. All I’m saying is everyone should take a good hard look at how they are living their life. Are you happy with what you have become? Not your career…YOU. Are you happy with the body you have? Are you happy with diseases such as Diabetes, all Mental/Nervous disorders? Americans have been getting sicker and sicker and bigger and bigger every year. What if, instead of doing the same things year after year we go back to the original. Let’s get off our asses and DO SOMETHING! Let’s eat the way our ancestors did before the advent of farming. Let’s MOVE like our lives depend on it, because it does. Believe me, it does. I’m not saying that your nutritionist and your personal trainer are wrong…wait, maybe I am saying just that! How does milk benefit me? Calcium? I can get that from my veggies thanks. And when it comes to working out why should we isolate muscles to work them? Is our body designed to work only one muscle at a time or as one machine? How will having really big biceps help me run? How will a treadmill help me carry my friend 10 miles out of the woods when they break their leg? People just need to rethink their lives. Try to get better, not to be different, just a better you. I apologize for the rant, I just get so frustrated when I see commercials for finding a cure to some disease when we already have one that works…The paleo diet. So many things can be cured by eating differently and breaking away from the Zoo Human. Our society puts too much effort into helping symptoms not prevention. Some days I feel like I should just run away and live on my own, in the wilderness and too just be me without worrying about society and what shirt to wear to work tomorrow. All the trivial nonsense is getting to me more and more as I journey toward a better me. I am way over due for a new post. I have been extremely busy these last 3 weeks. Wow…It’s been almost a month since my last post. The Paleo challenge I have set for myself has had it’s ups and downs, but for the most part it has been a very Paleo diet. I must say that I enjoy eating Paleo and living this lifestyle. That is the main thing I have learned in the last month of doing this challenge. It has also driven me to dislike winter. Not hate it, just dislike it. If I didn’t have a snowboarding pass I would be chomping at the bit for spring to come. I miss being outside barefoot all the time, wearing shorts and just enjoying nature. I still enjoy nature, but it’s not the same. Nicky and I went camping a month ago. Not cabin camping, not tent camping, TARP camping. We took a big blue tarp that we bought at Home Depot, some cooking supplies and some wood cutting supplies and we set out. We went to Phillips Creek in Allegany County NY. It’s a nice little area designed for hiking, snowshoeing and horseback riding. We didn’t want to walk far in case something happened and we needed to get back to the truck but we wanted to be far enough in that we couldn’t see the road. We ended up walking roughly 200 yards down the trail and went about 200 feet into the woods and began to set up camp. The first thing we did was find an area that was large enough to accommodate the TeePee we planned on building. After we found a suitable area it was time to look for some sturdy poles. We lucked out. The area we chose had plenty of down trees that were just the right size for what we needed. We used a saw to cut 5 nice poles and then lashed 3 together and set the other 2 in place. After wrapping the tarp around the poles and staking it all down we found that we had a pretty nice living space. The original plan was to have the fire inside the teepee with us but we found that it would be a little too crowded for our safety. We placed our fire outside and had some nice meals, relaxed and enjoyed the company of some friends who stopped by to see us. Overall I had a very nice day being away from civilization for a while. Being away from the hustle and bustle for a while can really relax you. Around 4:30 am I started to hear the tree branches in the forest start to creak and crack under the bitter cold. It was frightening to hear large branches slamming into the ground nearby. After about an hour of this I heard the beeping of a truck backing up. I was afraid that it was a tow truck taking away my dads pickup. I decided to wake Nicky up and head out to the truck to warm up and await the sunrise. She was reluctant to say the least but I didn’t want to wait and find that our truck was gone or find a tree branch in the teepee with us. It turns out that it was just a snowplow turning around in an intersection nearby and we waited for morning in the truck. When it was light enough to see without the aid of flashlights we went back to tear down camp and head home. After we loaded everything into the truck we met my parents at a nearby restaurant for breakfast. We ate like champions that morning. After conquering the great outdoors for a night in the middle of winter you are a champion. But a tired champion at that. When we got back to the great city of Buffalo we passed out…hard. For about another 3 hours. It is very physically draining being out in the cold. You don’t realize how much energy you burn just staying warm. Overall it was an amazing experience and I would love to do it again. Being outside is essential to happiness no matter what season it may be. 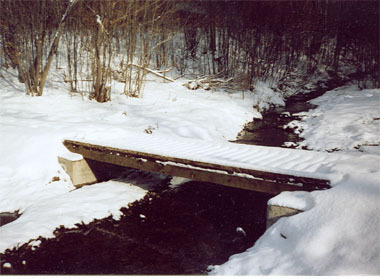 photo from the NYSDEC website. Thank you all for taking the time to read this extra long post today and I hope you try this sometime. Leave a comment if you have ever gone camping in the winter, or if you haven’t, what is the craziest thing you have ever done in the winter.